Special Events - Website of Glens' Association! The Glens' Association holds four major events during the year - the Annual Reunion, St. Patrick's Day, the Annual Meeting, and the Annual Regimental Family Levee. The Glens' Association takes part in other events to promote the heritage of The Regiment. 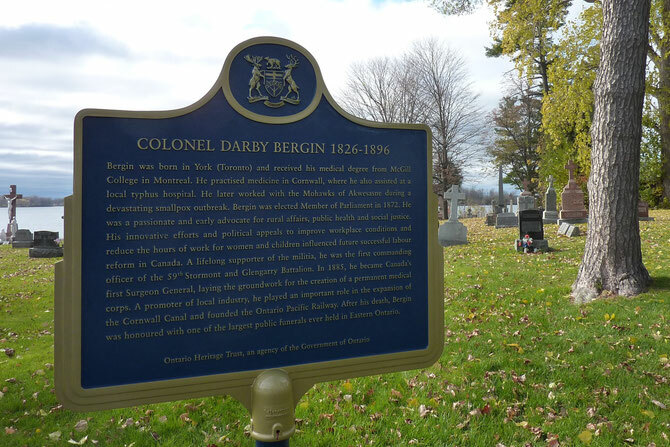 On Thursday, November 8, 2016 at the Cornwall Armoury beginning at 7 pm, our first Regimental Commanding Officer and Canada's first Surgeon General was recognized by the Ontario Heritage Trust with the unveiling of a heritage plaque honouring Colonel Darby Bergin, M.D. M.P.. Colonel Bergin's exploits were many. The essay submitted to Ontario Heritage Trust is below for your review. The plaque was permanently installed at Precious Blood Parish Cemetery, 18318 SD&G County Road 2, Glen Walter, ON. The land where the cemetery is located was the property of Colonel Bergin's maternal ancestors. He was buried in the family plot. An aerial view of the cemetery can be seen below. A beautiful riverside location. The plaque and the view of Colonel Darby Bergin's obelisk to the right of the plaque down by the river.